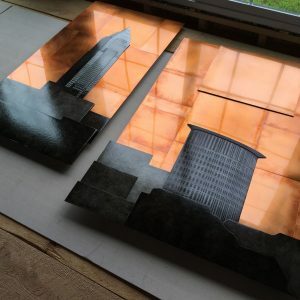 Chris Zielski is the artist and owner of Copper Leaf Studios. Her background is in arts education, with her B.S. & M.A. from a joint program between Case Western Reserve University and the Cleveland Institute of Art. While artists are typically trained in one discipline, arts educators need to be fluent in a variety of media. 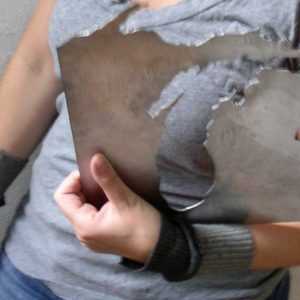 This diverse background has had a huge impact on her artwork, which combines traditional printmaking, enameling, metalwork, and photography techniques. 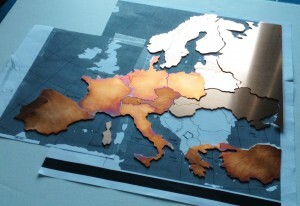 Every piece of artwork is hand cut and individually crafted from copper and zinc. Color variations are a natural and beautiful part of the process. Because each piece is created individually, slight variations add to the unique character of the work. The finished surfaces are coated with a thick layer of enamel to preserve the colors and enhance their durability. Want to take a peek behind the scenes? Sign up for our Newsletter.